Once upon a time, if you asked most people if they’d ever listened to Brockhampton, one would have received a response like “No. Who’s he?”but now, having recently released their long-awaited fourth studio album, ‘Iridescence’, the U.S. based hip-hop boyband are soon to become a household name, both in and out of the rap community. The album has already shot to No.1 on the U.S. Billboard Hot 200 and the accompanying music videos like ‘Jouvert’ have, within a week, received over one million views. But where did this ragtag motley crew of diverse talents come from? Starting with their first album, ‘Saturation’, released in June of 2017, they set out to, well, saturate the LA rap scene with their sound. The group of 6 rapping members (supported by many non-musical members involved in production and other aspects) made waves with tracks like ‘Heat’ and ‘Gold’. Their heavily stylized, DIY music videos introducing the world to characters like Kevin Abstract – the closest thing the group has to a front man – and Merlyn Wood – the Ghana-born wildcard rapping about wanting to be adopted by Beyoncé. August of the same year saw the release of their second album, ‘Saturation II’. They were gradually beginning to gain peoples attention. Listeners got to know Matt Champion, Dom McLennon, Joba, Ameer Vann, and the aforementioned Kevin and Merlyn. They broke new grounds with their track ‘Junky’. In the song, Kevin Abstract speaks about being gay in the hip-hop community and the homophobia which still exists within it. This was another sign that Brockhampton offered something new, and further cemented their unique sound. Borrowing from many genres and taking influence from contemporaries like Tyler, The Creator and Kanye West, their fresh style won them a loyal fanbase. This fanbase didn’t have to wait long for a third album from the group as ‘Saturation III’ was released in December of 2017. By now, plenty of people knew who Brockhampton were, and hailed their newest album for songs like ‘Boogie’ and ‘Rental’. Their plan to refuse to be ignored by the community had worked and by releasing 3 studio albums in under a year, they had blasted into public consciousness. However, their time in the sun passed too quickly for the group, as their new fame seemed to have come with new problems. Soon after announcing their plans to release their fourth album, which was to be titled “Puppy”, in 2018, allegations of sexual misconduct surfaced around member Ameer Vann. Vann was the face of all three of the group’s albums and was therefore the face of the collective. He was subsequently removed from the group in the midst of their tour, halting the band’s plans for the foreseeable future. In an announcement made at the time by the group, they claimed that they had been lied to by Ameer regarding his behaviour. The group also made the decision to push back the release date of “Puppy”. For several months, there was much uncertainty about the future of Brockhampton. The controversial change of lineup prompted many to believe they would not bounce back from their fall from grace, that they had flown too close to that proverbial sun. The renaming of Puppy to “The Best Years of our Lives” did little to dispel rumours of Brockhampton being over before they had begun. During an appearance on Jimmy Fallon, the group performed a new song, Tonya, with a new face, a Bearface, to be specific. Belfast born Bearface, originally a background member of Brockhampton, made his debut as a frontline member on the show. Despite the success of the show, many interpreted Bearface as being used as Ameer’s replacement. Still the group’s future remained uncertain. This changed with the release of three singles in the summer of this year. ‘1999 Wildfire’, ‘1998 Truman’ and ‘1997 Diana’. These songs had the same hard-hitting sound of the ‘Saturation’- era Brockhampton, the sound which garnered them fame. New breakdowns at the end of Truman and Wildfire showcased Bearface’s true talent and proved his place as the group’s sixth performing member. The songs were accompanied by yet another renaming of what was originally ‘Puppy’. ‘Iridescence’ was announced for September of 2018. 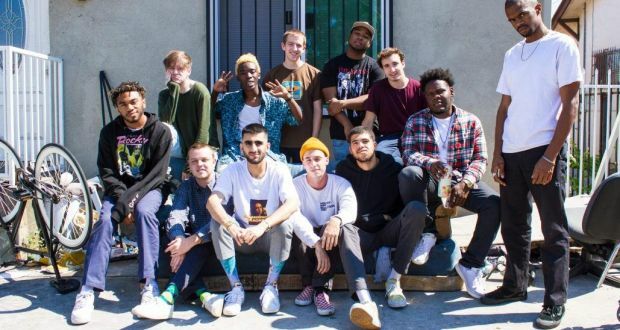 The album, which was released on the 21st of last month, was highly anticipated as fans waited to hear what this new Brockhampton had in store. And boy, was it worth the wait. The album has blasted its way to the No.1 spot on Billboard, taking over Eminem’s ‘Kamikaze’, a very, “different” album to Brockhampton’s Abbey-Road born outing. But still the question remains; who exactly are Brockhampton, and where do they go from here? Brockhampton are the groundbreakers of modern hip-hop. While the old icons like Eminem crumble and the fresher faced Kanye seems to be selling his soul to Donald Trump and Lil Pump; Brockhampton are the group giving the long-silent a voice in the genre. The diversity of the group works in their favour, as it allows them to borrow from so many genres. This is most apparent when hearing what Bearface adds to the group. His grungy angst comes through in a more organic sound. Rather than the electric beats of the group’s DJs, Jabari Manwa and HK, Bearface brings a rockier sound with guitars and piano, and lyrics to boot his moody vibe. The whole group has something to say. Whether it’s Kevin pointing out the trials of being a gay man in hip-hop, Merlyn laying down verses speaking of the plentiful bad sides of being an African immigrant in modern America, or Joba singing about not being believed in. They could be the first of a new generation of rap groups of their kind. Or perhaps they are too unique won’t be matched? For now, only time will tell.